M-D Pneumatics™ 3200 Mechanically Sealed Vacuum Boosters are used to supercharge vacuum pumps to greatly extend pump performance. This allows for much faster pumping speeds and deeper vacuum levels. 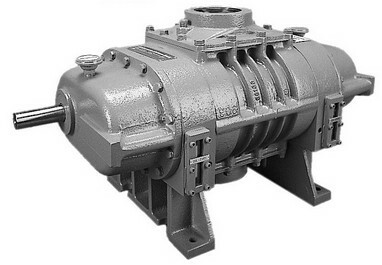 M-D Pneumatics vacuum boosters from Tuthill Vacuum & Blower Systems are utilized worldwide in the manufacture of chemicals, petrochemicals, plastics, semiconductors and wood composites as well as food processing, vacuum furnace applications and many other general applications in industry. Model 3200 vacuum boosters provide pumping speeds to 400 CFM (680 m³/h). M-D Pneumatics™ 4000 Mechanically Sealed Vacuum Boosters are used to supercharge vacuum pumps to greatly extend pump performance. This allows for much faster pumping speeds and deeper vacuum levels. Model 4000 vacuum boosters provide pumping speeds to 720 CFM (1220 m³/h). M-D Pneumatics™ 5500 Mechanically Sealed Vacuum Boosters are used to supercharge vacuum pumps to greatly extend pump performance. This allows for much faster pumping speeds and deeper vacuum levels. Model 5500 vacuum boosters provide pumping speeds to 2700 CFM (4590 m³/h). M-D Pneumatics™ 7000 Mechanically Sealed Vacuum Boosters are used to supercharge vacuum pumps to greatly extend pump performance. This allows for much faster pumping speeds and deeper vacuum levels. Model 7000 vacuum boosters provide pumping speeds to 4500 CFM (7650 m³/h). M-D Pneumatics™ 9000 Mechanically Sealed Vacuum Boosters are used to supercharge vacuum pumps to greatly extend pump performance. This allows for much faster pumping speeds and deeper vacuum levels. Model 9000 vacuum boosters provide pumping speeds to 7300 CFM (12400 m³/h). M-D Pneumatics™ 1200 Mechanically Sealed Vacuum Boosters are used to supercharge vacuum pumps to greatly extend pump performance. This allows for much faster pumping speeds and deeper vacuum levels. Model 1200 vacuum boosters provide pumping speeds to 12700 CFM (21600 m³/h).